Have you ever tried to copy and paste information off of a webpage only to find that the formatting was super wonky or that it copied everything except the piece of information you truly cared about? Even worse, you didn’t realize it until you went back to use the information later. So frustrating! Do you wish there was a way to ensure that the information you want is saved just the way you want it? Even better, to do it with two clicks? The Evernote Web Clipper is exactly what it sounds like – a tool that copies (clips) information from any web page and saves it to Evernote. Download the free Chrome plugin. If you’re not already using Chrome as your web browser, stop right now and download Chrome. I’ll wait. Sign into your Evernote account. You do have LastPass saving all your information securely, right? If not, I’ll wait again. Browse the web as usual. I hope this one is self-explanatory. Come across information that you need to save. If you’re not sure what this might be, keep reading. That’s next. Hit the handy dandy Evernote Web Clipper button on your browser toolbar. Review the information auto-populated and make adjustments as needed. Clip: There are several options to determine exactly what you information off the page you want to save. I find the auto selection is accurate about 90% of the time, so it’s worth a quick glance. You can also easily see on the page itself what is selected. Organize: Evernote selects which Notebook the information is most likely to be saved to. Tag: You can manually add any of your existing Evernote tags, or add new tags as needed. Add remark: Include any additional notes you want to remember on the page or why you saved the information. Hit “Save.” That’s it, you’re done! Why yes, yes, you are. Excellent question. There are three primary types of information I find super useful to save using the Evernote Web Clipper. Payment and purchase confirmations. You know, the utility bill, the credit card bill, travel confirmations and the endless endless school communications. I always, always save payment and transaction confirmations using the Evernote Web Clipper. This ensures that all my payment confirmations are saved in the same place, and eliminates any risk that an email confirmation didn’t come through. Two clicks and I can save it with Evernote web clipper. Articles to read later. I read a lot of articles and blog posts online. Often, I either don’t have time to read the full article, or I know that I want to go back and reference it. With the web clipper, any article is instantly available for me to read later on my terms. Bonus Tip: Tag all of these with a “to read” tag to find them easily! Limited time-only pages or offers. This is especially useful when you’re not sure if you want to take advantage of the offer in the limited time frame, but know you might want to purchase the next time it’s available for sale. Saving the sales page while it’s available gives you time to study it in detail and make a decision on your time. 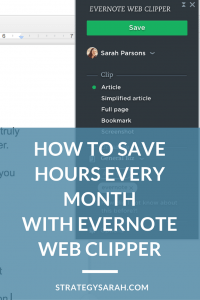 Using Evernote Web Clipper has saved me countless hours of headache trying to save information consistently and then finding that information when I need to use it. If you haven’t already, what are you waiting for? 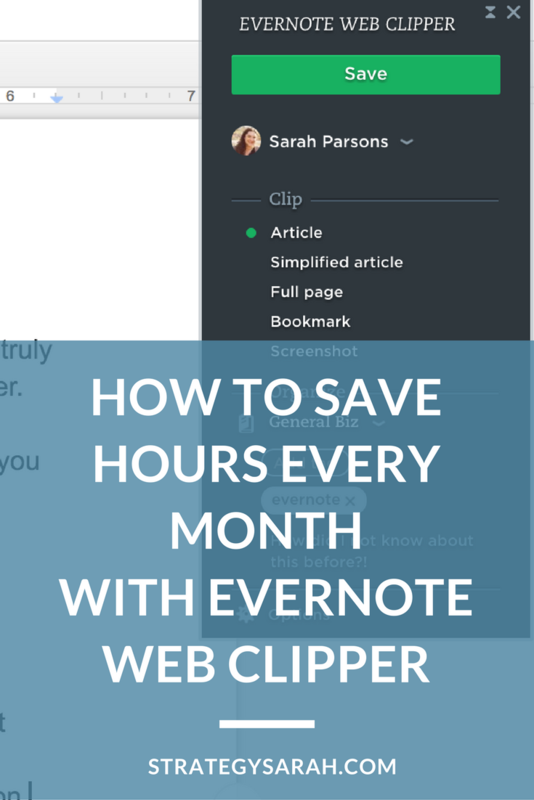 Download and start using Evernote Web Clipper today. What’s the best way to capture a to-do list? 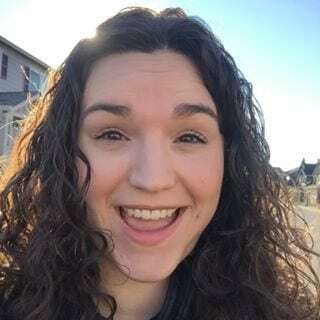 Welcome to 31 Days of Timesaving Tools, Tips & Templates! Today, we’re going to focus on the ubiquitous To Do List. At it’s best, a to-do list saves time by focusing your efforts, ensuring that you don’t need to re-do key tasks, run additional errands or miss deadlines. At it’s worst, a to-do list becomes a weight that ties you down to arbitrary tasks and causes more work than truly required. The only to-do list that is going to work is the one that you decide is going to work and commit to fully. Unless you are all in, it won’t last. There are endless tools to capture to-do lists and manage projects (some of which we’ll get into in the coming days), but the most simple is a blank document – either physical paper or a blank digital document in any software system you choose. That said, there are systems that have more of a chance than others, and that comes down to knowing yourself. Do you tend to have more success with paper or digital systems? The bottom line: Don’t over-complicate it. 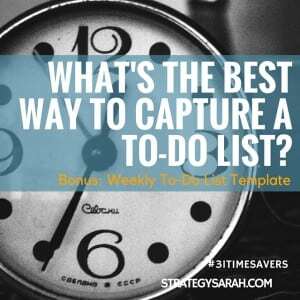 Find a way to capture to-dos that you will use consistently. Personally, I’m currently having the most luck with Evernote. Start with an Evernote template with my to-dos categorized into key areas. Each week, I copy the template to a new note, write down my to-dos, and add a reminder to the note so it’s pinned to the top of my Inbox. At the end of the week, I clear the reminder, and file the note for reference. (If it was a particularly unproductive week, I may just change the date in the title of the note, or copy the entire thing, leaving all the yet-to-be-done tasks). I’ve created a shareable Evernote Weekly To-Do List Template* for you to adapt. Sign up at the bottom of the post to access this Evernote template. *If you’re using the Evernote web browser, once you’re signed into your account, you’ll need to hit the “Save to Evernote” button on the upper right. You won’t be able to edit on this screen though. Rather non-intuitively, you need to go to your Evernote main page / dashboard, and the template will be in your Inbox notebook as an editable note. Make a simple to-do list for this week using a piece of paper, blank doc or my Evernote template above. Pick the top six items that must be accomplished. Complete your top six items. Give yourself a huge pat on the back, and do something fun and fulfilling with your time saved! This post is part of 31 Timesaving Tools, Tips & Templates.